Travelling the Interislander Ferry Wellington didn’t quite match up to the romanticised TV advertisements. But its a great experience on a beautiful summer day with calm seas. Take your seasickness pills just in case. The whole process of booking and boarding is pretty simple. We booked online and left Nelson at 9.00am to make the Picton sailing at 1.15pm. You can’t miss the Ferry Terminal, it’s well sign posted on the way in and through Picton. We drove to the ticket booth, presented our ticket and were directed to a queuing lane. You’ll be waiting a while so turn the engine off and read a book. Once the queue got the ‘all clear’, the procedure was very quick. We moved one queue lane at a time into the lower deck of the Ferry, put the car in ‘Park’ and the handbrake on! We then rejoined passengers heading up to the expansive entertainment areas. It was only after we entered the open upper deck outside, that I really began to enjoy myself. 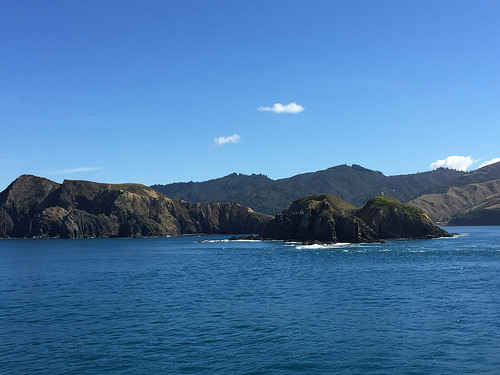 Beautiful views on either side as we passed through the Marlborough sounds into the Tory Channel and onwards through Cook Strait. The Ferry wasn’t that crowded today with many international visitors having already completed their NZ trip. It wasn’t until we popped downstairs to one of the restaurants that Michael and I turned our green faces towards each other and in silent agreement headed back into the fresh air again. (Note to self: take seasickness pills one hour before boarding). Even though it’s only 3 or so hours for the actual sailing, you really need to give yourself half a day for the trip. Check-in time is one hour before sailing and disembarking will probably take you another half hour. But it is very relaxing and gives you a break from driving. For more details see this blog. Now onward to Martinborough. Happy Travelling. Still on the “to do” list – I’d have to pick a calm day like you did. A great way to see the Sounds. Lots of lovely wines in Martinborough – I am sure you will enjoy your stay there. Wish more people would visit this great little town. It’s one of the nicest places in New Zealand to bike around the vineyards,especially on a warm and sunny day. Really like the locals – very friendly. 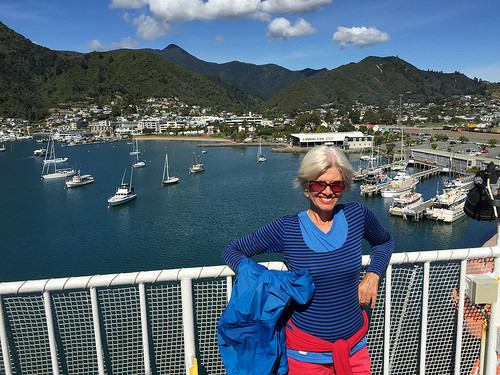 Cruising on the Inter-Islander…… thanks now I can’t get that tune out of my head – hence sharing the love lol. Looks like you had perfect conditions but yes, I’ve learnt from a previous boating experience, stay upstairs in the fresh air no matter what! The upside is that you’re forced to relax and kick back. Will remember to stay upstairs on the way back as the weather looks a bit iffy.